This Sunday-Morning Omelet with Mushrooms and Goat Cheese will hit the right flavor notes when you want a special breakfast, and this recipe shows you all the steps for How to Make an Omelet! And this tasty omelet is low-carb, Keto, low-glycemic, gluten-free, and South Beach Diet Friendly! Click here to PIN this Sunday Morning Omelet with Mushrooms and Goat Cheese! 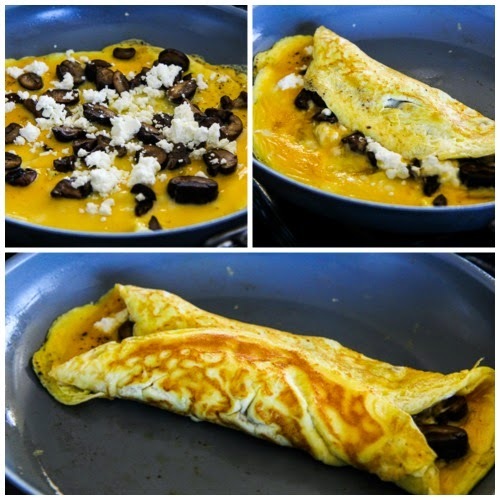 On the weekends I love to make omelets, like this delicious Sunday-Morning Omelet with Mushrooms and Goat Cheese that I first made back in 2006 when my brother Rand had sent me a flip-over omelet pan. Using a pan like that certainly makes it easy to get a perfect omelet, and I used the pan for a few year before I decided it was easy enough to make an omelet without the special pan. Then when I moved to the new house, the omelet pan didn’t make the cut, so recently when I decided this favorite recipe absolutely must have new photos, I enrolled my niece/cooking assistant Kara to help me capture the easy steps of making a perfect omelet. It’s important to have a good non-stick pan if you’re going to make an omelet like this. I used my favorite Green Pan, but any small size non-stick pan will work. Of course this recipe is perfect for Meatless Monday, and I’d happily eat this any time of day, not just in the morning. Sunday-Morning Omelet with Mushrooms and Goat Cheese was updated with better photos and better instructions, June 2015. You’ll need to saute the mushrooms first and then rinse out the pan before you make the omelet. Have the goat cheese measured out and if you think your pan might need some help in the non-stick department, give it a mist of olive oil. When the omelet center is mostly cooked, add the sauteed mushrooms and the goat cheese and cook another 1-2 minutes to melt the cheese. Then carefully flip over one side and then the other side to make a folded omelet. That’s all there is to it; enjoy! Turning out a perfect omelet is pretty easy once you practice a bit; hope you will try it! This Sunday-Morning Omelet with Mushrooms and Goat Cheese will hit the right flavor notes when you want a special breakfast. Heat olive oil in pan, then saute mushrooms in until softened and slightly browned, about 4 minutes. While the mushrooms are cooking, whip eggs with milk and Spike seasoning and crumble the goat cheese. 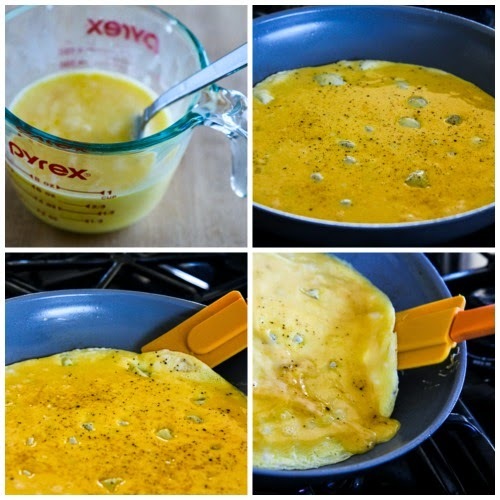 Spray omelet pan with olive oil, (I use an olive oil mister for this, one of my favorite kitchen tools!) Heat pan about 30-45 seconds, then pour in egg mixture and cook about 2-3 minutes. When eggs are starting to look set on the edges, use a rubber scraper to lift the edge of the omelet while you tip the pan and let the uncooked egg flow under the cooked part and get firm. When center of the omelet is mostly cooked, add the mushrooms and goat cheese. Cook about 1-2 minutes more, or until the cheese is starting to melt and the eggs are nearly as firm as you like them. This Omelet with Mushrooms and Goat Cheese would make a good breakfast for any low-carb eating plan, including any phase of the South Beach Diet. Looks delicious 🙂 Are you using chestnut mushrooms? Will, they are just brown Crimini mushrooms. Shirley, how lucky to have a local source for goat chees! Hope you enjoy it. I'd feel in heaven if I woke up to this omelet! Well, you make it look easy with the step by step pictures. And I will definitely try it for breakfast, lunch and even dinner! YUM! Zerrin, we had fun working on those pictures. Hope you enjoy; I love this combination! Ah, well, it's Monday morning, but I'm going to make an omelet today for Meatless Monday. Love the step-by-step photos (well done, Kara!). Thanks Lydia; Kara did a great job at modeling the omelet techniques! 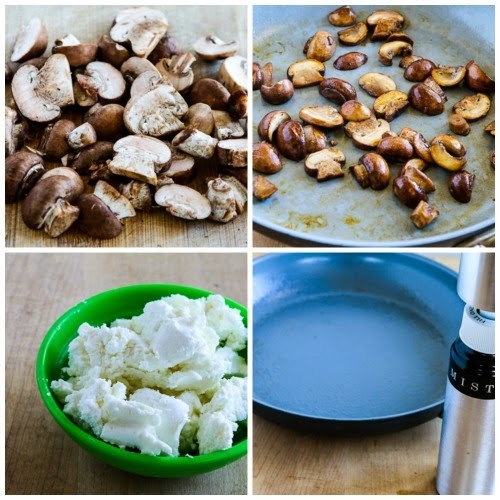 This grabbed my attention right away, partly because of the ingredients (you can't go wrong with goat cheese and mushrooms) and partly because of the photo. I am now thinking of making this for dinner sometime this week. Thanks Dara! I hope you enjoy; Kara and I had fun trying to capture all the steps in photos. I love your Blog and recipes Kalyn. This dish encompasses 3 of my favorite ingredients:mushrooms, chevre and eggs. I also love the gift from your brother Rand. What a nice treat to get in the mail. I am going to look into that link on the recipe page. Thanks again for this recipe. I've made it many times myself, after eating in a local Belgian restaurant here in California. I am going to try making it your way. It's always fun learning how to make recipes in other peoples style + techniques. What a great idea to combine mushrooms and goat cheese! I love omelets with brown crust like that! No pale omelets! And what a nice gift! Beautiful omelette Kalyn. I’ll make it this weekend for brunch. I notice you’re using Spike as a seasoning now. It’s good, isn’t it? Amazing what they invent!The omelette sounds and looks delicious, Kalyn, I’m putting it on my ‘must try’ list!